Crab Decks & Tiki Bars of the Chesapeake Bay takes you on a journey to authentic seafood restaurants, crab shacks, dock bars and tropical lounges. The Maryland and Virginia editions cover waterfront destinations on the Chesapeake Bay and its tributary rivers and creeks. We believe if you can’t see the water, you don’t get the full Bay experience. Most restaurants are family-owned businesses that buy seafood fresh from local watermen. Palm trees are optional; ice-cold beer is not. To help you pick the perfect Chesapeake getaway, both books are divided into geographic regions of the Bay. 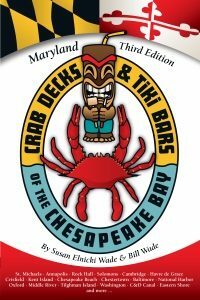 Crab Decks & Tiki Bars of the Chesapeake Bay provides descriptions that paint a vivid image of each restaurant’s décor, atmosphere, cuisine, and house specialties. 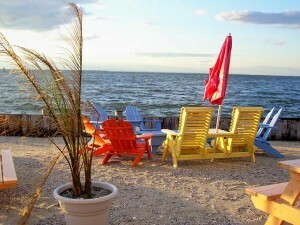 Many reviews include colorful bonus information on the history, folklore, culture, and traditions unique to each neck of the Bay. Plus, every write-up includes a local map and photos taken on-site. And at the back of the books, the Tiki Tracker helps you document where you've gone and what you did on your Chesapeake Bay adventures. Annapolis, Easton, Virginia Beach, Norfolk and Richmond. Our one-of-a-kind Atmosphere Meter lets you know what to expect before you arrive. The destination's ambiance and vibe are rated on a scale of 1 to 10 from casual to formal (frosty beer mug to crisp martini glass).